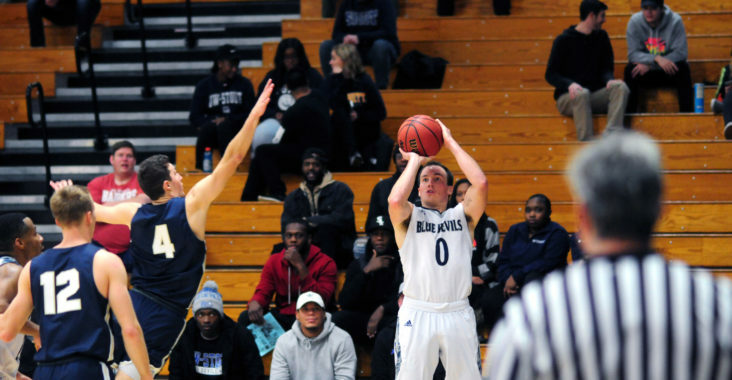 This issue’s Student-Athlete Spotlight is John Keefe, a senior guard on the University of Wisconsin-Stout Men’s Basketball team. Keefe is majoring in early childhood education and is from Medford, Wisc. Why did you choose Stout? I chose Stout because I wanted to play basketball at a high level. Tt was close to home and my sister went here. Outside of school and athletics, what are some other things you like to do? I like to travel, go see places, and read books. I try to see the world as much as I can and see what’s out there in life. I also spend as much time as I can with my family. What are a few interesting facts about yourself? I was ranked nationally in “Guitar Hero,” I play in ping pong tournaments, and I’m involved in magic shows. Who is your favorite pro-athlete and Why? Jamal Crawford because he is very humble and a very good basketball player that has had an amazing career thus far. What is your plan after college? We’ll see what happens, I have a lot of options, but have not decided what I wanted to do when college ends!